Well, it’s been over a year since I’ve last posted here. There have been many reasons why silence has overtaken this portfolio, but I shall not worry about offering them to you now. Time has passed, and now I should move forward with some new creativity, eh? Today I offer you a piece of art that I did for a GM screen. It’s an image of a custom creature I created for the first major story arc for my local group’s tabletop campaign, A Game of Hands. This things are called by many names across the world: Sovereign, Shapers, Negators… Each civilization that encounters them has chosen a different name based upon the dread that this thing inspires. So it’s appropriate that I created a GM Screen, isn’t it? It’s meant to be cut into four 8.5×11″ panels and slipped into like The World’s Greatest Screen. This is actually one of my first attempts at properly painting in Photoshop. I’ve done colorwork before in it, but never to this extent. I’m still learning, though, so this one’s quite rough. But, hey, practice is practice! I’ll also be posting the final painted miniature I did in the near future. It’s been a while since I’ve been able to relax through art. So tonight I took the chance to kick back and play around a little with a simpler style compared to my regular pencil work. 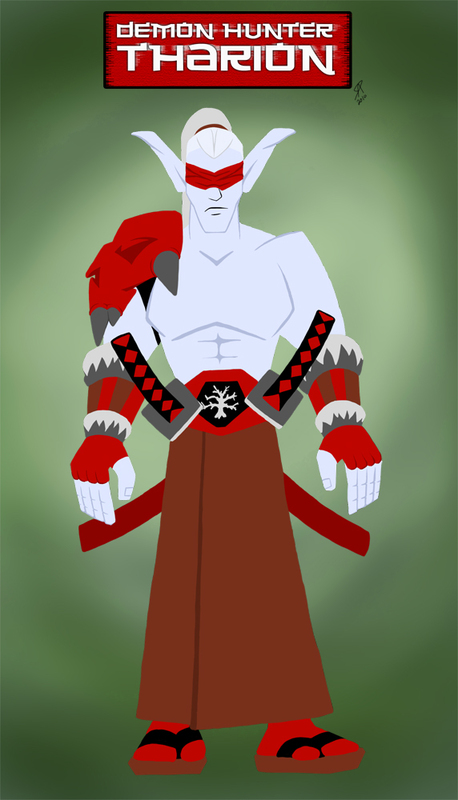 One of my favorite television shows is Samurai Jack, by Genndy Tartakovsky, so I decided to just experiment with reinterpreting my World of Warcraft character, Tharion Greyseer, in this style. It was an interesting attempt, as it takes a bit to wrap one’s mind around the borderless look that the series maintains. Details become light or non-existent as well, and it’s an exercise in understand which elements are important and which can be removed. I wholly enjoyed it, however, and will probably try to work a few other WoW characters like this sometime in the future. One of the original intents of Raptor13.com was to be a singular source to find all my endeavours. As such, I’m making a concentrated effort to cross-post here anything I post or create for my other sites. I’ll also be posting artwork as I have been in the past. Warcraft | LoreCrafted: Hooray! Hyjal! … Wait, What’s Hyjal? With Blizzard’s recent preview of the upcoming Mount Hyjal zone coming in Catacylsm, I figured I’d cover some of the lore surrounding the places and beings mentioned in the aforementioned preview. If you’re curious why some of us are excited for to see Hyjal, read on here! Just a brief well-wish from me to all of you. I hope your holidays have been warm, peaceful, and happy. We had a death in the family on Christmas Eve, and we’ve been scrambling to get arrangements made and the funeral planned. It was unexpected, and a heavy loss for all involved, so there’s been little to no time to do anything unrelated to this. I still intend to relaunch Rusted soon, but January 4th may be too soon. I also intend on resuming work on MADNESS AND INSANITY and getting the “Yoggyopolis” redesign up. But, again, this Monday isn’t looking likely. LoreCrafted, too, has seen a dearth of posts, not because of lack of subject matter, but because of lack of time. As the aftermath of this event settles, and as Christmas resumes (albeit, greatly delayed) for the rest of my family, I’ll be getting things back into place. I thank you all for your understanding. Be well and be safe. Beloved aunt to my brothers and I.
Beloved sister to my mother. Beloved daughter to my grandmother. Beloved wife to my uncle. Beloved mother to my cousin. And beloved friend to countless others. May God speed your soul to a peaceful rest. So about a month ago on Twitter, @LoreliAoD suggested a secret santa art exchange for some of the WoW community artists. Figuring that it’d be a fun thing in which to participate, I went ahead and threw my hat into the ring. In an amusing spin of coincidence, the person for whom I was to draw this gift ended up being a good online friend of mine, Ginny, otherwise known as Magicalmelonball on deviantArt or @immamoonkin on Twitter. 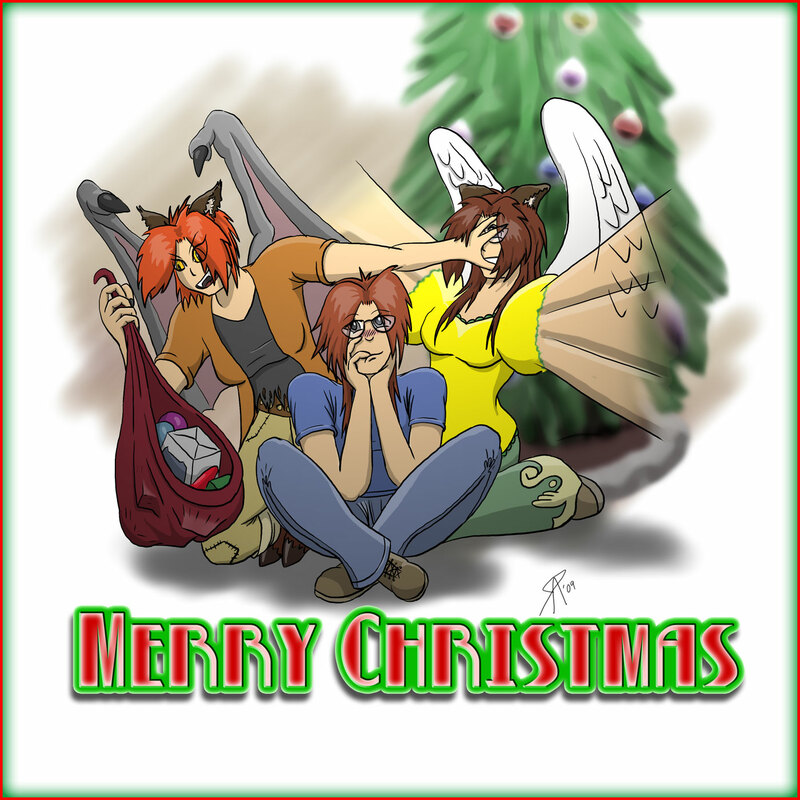 The pictures she posted as reference were her personal avatars, so I sketched together an amusing Christmas-themed pic that tries to showcase some of the personality seen in other works. At least, I hope it conveys some of that personality. I hope you like the pic! It’s an honor to have come to know you and I wish you the best in all things in the years to come.